The Bajo offers authentic acoustic tone with a broader frequency range than a piezo pickup. The custom voiced internal preamp is designed for an acoustic's natural phase and frequency response making it perfect for any steel string acoustic guitar. This noiseless system gives you all the top-end brilliance and all the full bodied acoustic tone you’ll ever want or need. 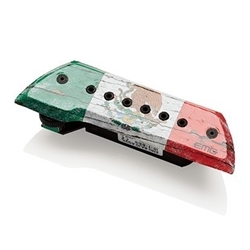 From Mariachi to Metal, Bluegrass and back, the EMG Bajo will deliver.